At the instant that the moon turns full in November 2010, the moon will rendezvous with the Pleiades star cluster in the constellation Taurus the Bull. Before the full moon, the moon lies to the west of the Pleiades. 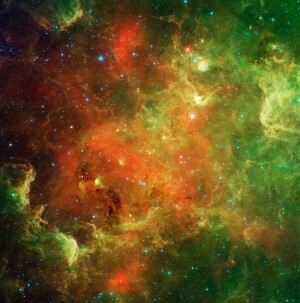 (West is to the right as seen from our northerly latitudes.) 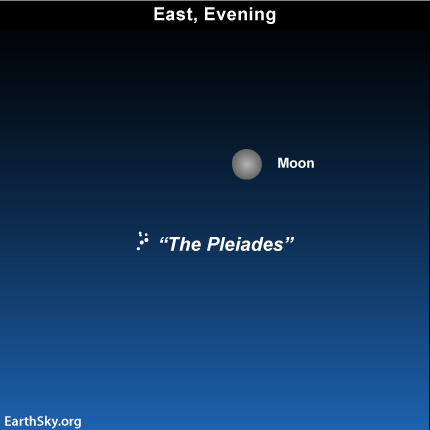 After the full moon, the moon moves to the east of the Pleiades. At full moon, the moon swings just south of the Pleiades cluster according to an imaginary system – similar to latitude and longitude – on the sky’s dome. Although the moon will look plenty full tonight, it will actually be a waxing gibbous moon. The full moon occurs at the instant that the moon stands most directly opposite the sun for the month. That full moon moment will fall on Sunday, November 21, at 17:27 Universal Time (11:27 a.m. Central Time). As seen from the Americas – after sunset Sunday – the moon will be to the east of the Pleiades cluster. The moon will be slightly past full then, as seen by us westerners. In the U.S., the moon will reach the crest of its full phase during the daylight hours on Sunday. Then, for us in the Americas, the moon will lurk beneath our horizon and under our feet – in other words, on the other side of Earth. Yet, on the other side of the world – for example, in Asia – it will be some 12 hours later by their clocks. Therefore, that part of the world will see the full moon and the Pleaides pairing up at nighttime tomorrow. The full-looking moon may make it difficult to see the dipper-shape Pleiades star cluster on Saturday and Sunday nights, so you might need binoculars to spot the Pleiades in the moon-drenched heavens. Site contents copyright © 2019 Recorder Online	except as noted. All rights reserved. | 83 queries in 1.103 seconds.